Craving authentic Italian food? Bella Italia in Holiday Inn, Aerocity is doing home-style pasta, pizza, grilled meats (with a create-your-own option) and more. 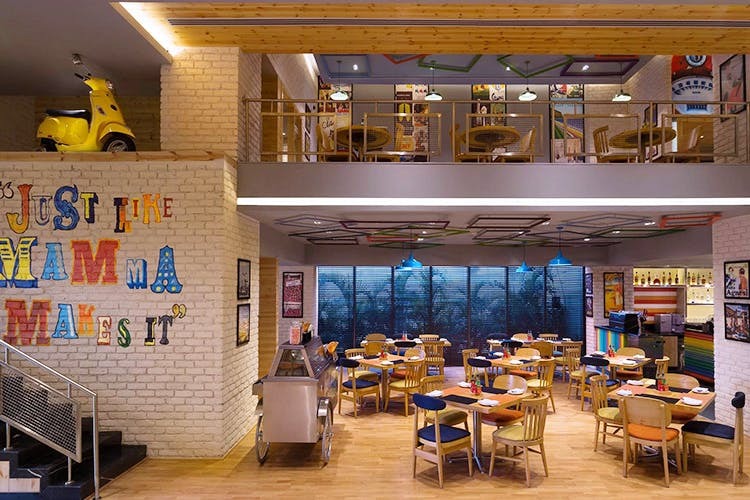 Plus, the multi-coloured decor will literally have you staring at the walls. The first thing that grabs your attention here has to be, unarguably, the decor—rainbow coloured walls and counters, giant murals of Italian supercars (and vintage ones), posters and frames hinting at all things Italian, and the wooden tables and chairs really make this space a stand-out one. Once you’re done maniacally taking pictures of the interiors, the food will take your attention for a drive—their authentic, home-style Italian options are bound to leave you spoilt for choice. The menu has options like classic pizza, and a thinner, crispier variant called Pizza Roma, as well as calzones, burgers, fresh pasta (the tenderloin and red wine ravioli sounds amazing) and grilled meats with sauces and sides that you can customise. They’ve even got gluten-free and vegan options for their dishes. They’ve also got an extensive buffet with a bunch of options. There’s even a fresh gelato cart parked right inside, where you can indulge in mini doughnuts, cookies & cream, their Brownie Bellissimo Sundae and other sugary treats. Head over to Bella Italia for amazing Italian food that’s as authentic as it gets. Don’t forget to try the shot glass desserts!